The Mahican confederacy of Algonquian-speaking native peoples was located on North America's eastern seaboard and in the woodlands area. They were originally from the Hudson River Valley (which separates modern New York State from Vermont), almost as far north as Lake Champlain which lies close to the border with Quebec. Two main groups formed after the European arrival and gradual settlement of traditional Mahican lands. The Stockbridge Mahican were formed of Mahican and other native people who relocated to this area on the Housatonic River, near a great meadow that is bounded by the beautiful Berkshire Mountains in western Massachusetts. The other group were the Brotherton. This was a term of convenience to describe firstly a mixed band of Mahican, Pequot, Wappinger, Mohegan, Montauk, and Narragansett who moved to land given to them by the Oneida in New York, and secondly a group of forty or so Raritan-Delaware from a New Jersey reservation called Brotherton. This band joined the first group in 1802 and the combined group moved to Wisconsin in 1833 under the name Brotherton. Although culturally similar to other woodland Algonquin, the Mahican were shaped by their constant warfare with the neighbouring Iroquois. Politically, the Mahican were a confederacy of five tribes (see main page) with as many as forty villages. In keeping with other eastern Algonquin, civil authority was not strong. Mahican villages were governed by hereditary sachems (who were granted office via matrilineal descent), advised by a council of clan leaders. The Mahican had three clans: Bear, Wolf, and Turtle. However, warfare required a higher degree of organisation. In times of war, the Mahican council passed its authority to a war chief who was chosen for his proven ability (in much the same way as ancient Rome would elect a dictator for the duration of an emergency). For the duration of the conflict, the war leader exercised almost dictatorial power. The sachem was the representative head for each band. The sachem also had various counsellors (elected representatives who were also known as chiefs) with whom he would consult in all public decisions involving the welfare of the members. These counsellors were called woh-weet-quau-pe-chee. In addition, the chief would consult with one mo-quau-pauw, or 'Hero'. The sachem was allowed to keep a bag of wampum or mno-ti (decorative items of wampum were signs of wealth). This bag contained wampum belts and strings of wampum that were presented to the sachem from different nations. In addition to the mno-ti, each sachem was the keeper of the peace pipe. Sachems were responsible for the overall peace between members of the community as well as peace among the communities and other nations. In this respect, the sachems were the Mahican version of the colonials' justices of the peace. The use of the traditional forms of decision-making changed dramatically during this time. A general council of sachems met regularly at their capital of Shodac (east of present-day Albany) to decide upon important matters that affected the entire confederacy. 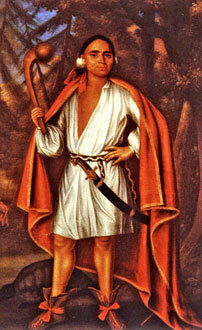 The Mahican were allied to the Munsee and Lenni-Lenape (Delaware). Agriculture - usually maize - provided most of their diet but was supplemented by game, fish, and wild foods. 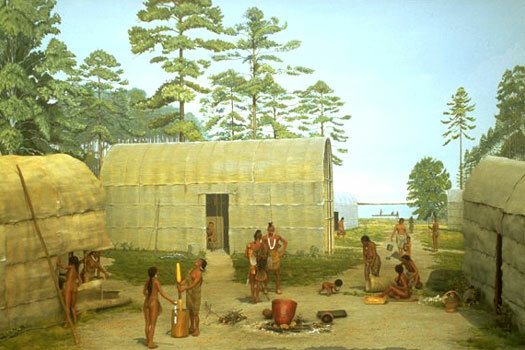 The Mahican were also hunters and gatherers and, for reasons of safety, they moved to scattered hunting camps during the winter, like other Algonquin, and usually spent the colder months inside their 'castles' (fortified villages). They were also traders. Copper, obtained from the Great Lakes through trade, was used extensively for ornaments and some of their arrowheads. Valuable wampum beads for trade were obtained from the Delaware and Naragansett. Once they began trade with the Dutch, the Mahican abandoned many of their traditional weapons and quickly became very expert with their new firearms. Contrary to the usual stereotype, most Mahican warriors were deadly marksmen. The mother of the famous Miami chief, Little Turtle, was a Mahican. These are in New York State unless otherwise noted. The name of (another tribe) in parenthesis indicates that the village had a mixed population. 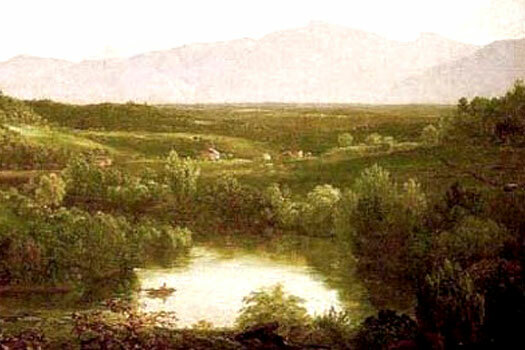 Aepjin's Castle, Chaghnet (Chugnut) (Iroquois), Hoosac (Hoosick) (Abenaki), Horicon (Horikan), Housatonic, Kaunaumeek, Kenunckpacook, Kaunaumeek, Maringoman Castle, Mohican John's Town (OH), Monemius (Cohoes, Monnemen's Castle), Nepaug, Nutimys Town (Shawnee-Delaware) (PA), Oswego (Iroquois), Otsiningo (Iroquois-Nanticoke-Delaware), Paanpaack, Peantam, Potick, Potie, Schaghticoke (Scatacook, Scaticook, Shachcook, Skachcook - NOT to be confused with the Schaghticoke in Connecticut), Shekomeko, Shodac (Shotak), Shakehook (Skatekook, Sheffield), Tioga (Munsee-Nanticoke-Saponi-Tutelo) (PA), Tullihas (Delaware-Caughnawaga) (OH), Unawat's Castle, Utfonango (Iroquois), Wechquadnach (Wukhquatenauk), Wequadnack, Westenhuck (Wnahktakook), Wiatiae, Wiltmeet, Winooskeek (Winooski), Wyeck, and Wyoming (Munsee-Shawnee-Iroquois-Nanticoke) (PA). Brotherton, Shekomeko (Shecomeco, Moravian), and Stockbridge (Wnahkutook).